Net Entertainment’s Pyramid: Quest for Immortality slot machine game is well-rounded. The slot features better graphics than seemingly al other Ancient Egyptian slots, and it breaks ground with its new revolutionary wild symbol delivery system. This brand new NetEnt developed slot was designed with an end of 2015 launch in mind, and is set to become their most successful Ancient Egyptian themed game. 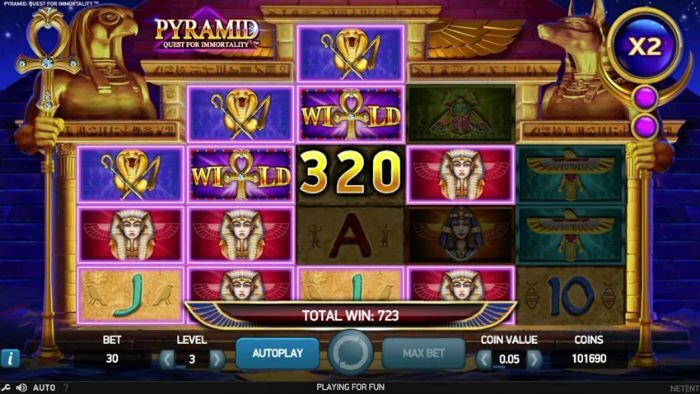 The Pyramid: Quest for Immortality slot features 5 reels (with a 3, 4, 5, 4, 3 symbol set-up – the first of its kind for Net Entertainment), as well as 720 ways to win. 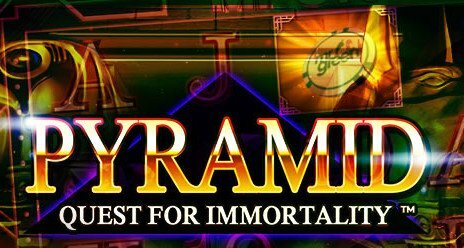 Read on to find out more in out Pyramid: Quest for Immortality slot review. As you might expect, the Pyramid: Quest for Immortality graphics are stunning. You’d never expect anything less from Net Entertainment. Those graphics include Ancient Egyptian gods and goddesses, famous Pharaohs, as well as notable artefacts from Ancient Egypt, such as the Ankh. Everything has been done to exceptional standards in the Pyramid: Quest for Immortality slot game. 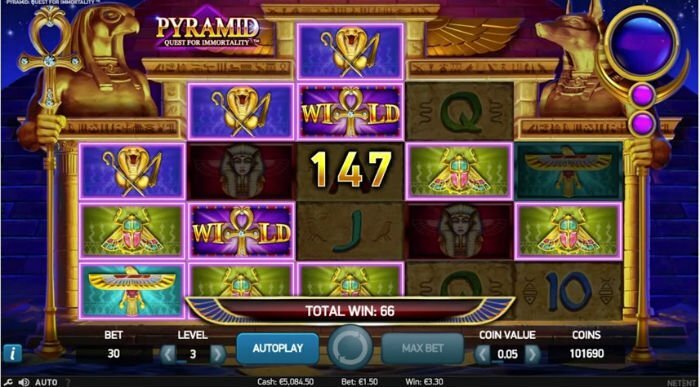 The Pyramid: Quest for Immortality video slot is also available to play as a NetEnt Touch game, as well as an online slot, though the wagering setup will be the same in both of the games. Naturally players aren’t going to be able to adjust any of the lines they play with in this game, but coin sizes and betting levels are adjustable as always, giving you a more than accepted wagering range, suitable for players on all budgets. The first thing to notice about the Pyramid: Quest for Immortality slot machine is that the reels don’t spin. Instead, blocks tumble down from above. This, of course, means that the slot utilises the Avalanche feature, which can also be found in other Net Ent slots, such as the acclaimed Gonzo’s Quest slot. The avalanche feature adds a nice touch to Pyramid Quest for Immortality game. The Ankh appears as a wild symbol in Pyramid: Quest for Immortality, and it can replace all other standard paying icons on the game, with the exception of the Pharaoh icon. Whenever wilds are used in winning combinations, there is a reasonably good chance that they will reappear on the second Avalanche spin. If they play a winning part on that spin, then they’ll reappear in the same spot again for the third Avalanche spin, and so on, and so forth. This is part of a new system, known as Wild Generation, and could be common for many Net Ent slots in the feature. Multipliers can also be won in this game, although they tend to be fairly low in value, often around the 2x mark. Still, it is better to have them, than not to. No free spin feature has been incorporated into the design of Pyramid: Quest for Immortality slot machine. Given that, the best Pyramid: Quest for Immortality slot bonuses tend to be those associated with the wild icons already mentioned above. NetEnt’s Pyramid: Quest for Immortality slot machine game is well-rounded. The slot features better graphics than seemingly al other Ancient Egyptian slots, and it breaks ground with its new revolutionary wild symbol delivery system. In other areas, or lack of them (such as the free spins bonus), you kind of feel as though the Pyramid: Quest for Immortality slot is short of a few bonuses. Nonetheless, it makes for an exciting addition to Net Ent’s Touch and online casino games catalogue.